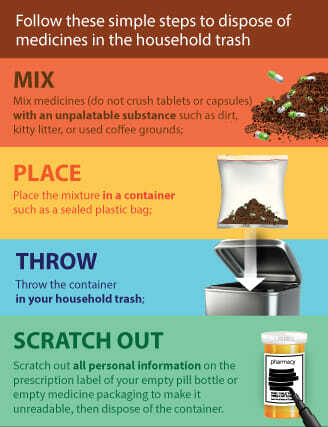 The best way to dispose of medications is to take them to a drug drop-box location. There are currently 4 permanent drug drop box locations in Big Horn County, including the Big Horn Valley Health Center (BVHC) pharmacy in Hardin, the Indian Health Services (IHS) pharmacy in Crow Agency, the Pryor Health Clinic #2 in Pryor, and the Lodge Grass Health Clinic in Lodge Grass. If you are not able to a…ccess one of the drop box locations immediately, then the medicines (other than a select few that are especially hazardous) should be thrown away in the manner shown in the graphic. There are 14 medicines that should be flushed immediately if you are unable to make it to one of the drop box locations, including: Benzhydrocodone/Acetaminophen, Buprenorphine, Fentanyl, Diazepam, Hydrocodone, Hydromorphone, Meperidine, Methadone, Methylphenidate, Morphine, Oxycodone, Oxymorphone, Tapentadol, and Sodium Oxybate.